I saw Martha Stewart using this juicer on her TV show. Now, I don't run out and purchase every single kitchen appliance she promotes or raves about. But she was going nuts over this juicer and I was in the market for a juicer and I loved the look of it. It is stainless steel beauty (whistle!). 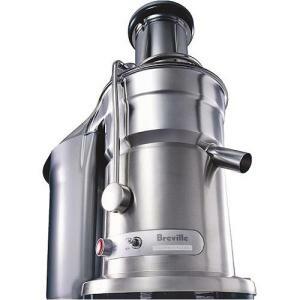 And it's not just Martha: I have asked a handful of juice aficionados which model they would recommend and they always mention the Breville brand. Juicers are quite an investment-- for a good one anyway. And there are hundreds on the market so it's tough to sift through all the information. And this Breville juicer has all the features you'd expect from a top-of-the-line juicer-- at an affordable price. I never thought of myself as a person who needs a juicer. I have a very nice blender, after all. But after trying to make vegetable juice in my blender-- which was not easy or convenient and involved a lot of straining and re-blending-- I decided to research juicers. This one has all the important features: It has wide feed tubes and a plunging utensil to push fruits and vegetables through. It has a huge pulp holder so you can juice away without having to stop and clean it out. I'm no wattage expert but the 1000-watt motor is amazingly strong and well built. You could power a car with this engine. In addition to making raw fruit and vegetable juices, you could use it for baby food, too.